So I found this new app that I'm sort of obsessed with and just have to share. Magazines are my guilty pleasure. I just love when my Us Weekly arrives on Friday afternoons, and I love it even more when I find my highly anticipated Food Network Magazine in the mailbox. It just so happens that while I was flipping through my FNM, I saw an add for a free 30 day trial of Next Issue. 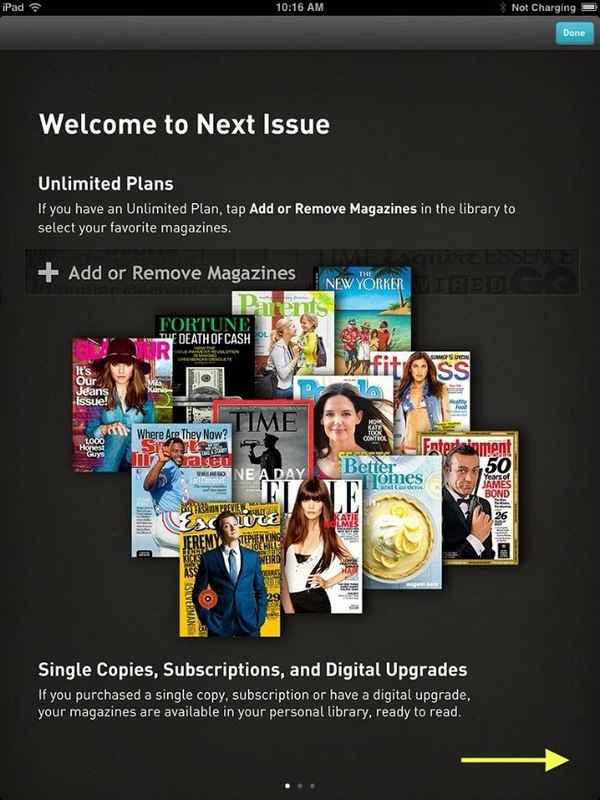 Next Issue gives you access to over 100 magazines, AND back issues. The standard subscription is 9.99 a month, or you can go for the premium subscription at 14.99, which includes my third favorite guilty pleasure, People. I absolutely love food magazines, but the problem is I hoard them. In my mind, they're basically a mini cookbook- so how could I throw them away? I've convinced myself that subscribing to Next Issue is very green of me. Of course, I'm not giving up my FNM, but now I can peruse Cooking Light, Bon Appetit, Food & Wine, Rachael Ray (the list goes on!) and just screen cap my favorite recipes. Ah, the joys of technology. This app was one of my husbands gifts to me for Christmas. I love it! So nice to have it on hand when appts run late a kid falls asleep in my arms.